So, You Come Here Often? When you stop by for a read you learn something (or not) about me. But, how about the flip-side? I’d like to know a little something about you. Even if you think that I already know or know that I already know about you, why don’t you leave a little hello or a note about yourself and a link to your blog, or Instagram, or whatever in a comment below? Maybe some of the other folks who come ’round would like to learn about you, too. Hi Fuzzy! I’ve been following your blog and posts for years and I still find it hard to believe that you and I have never crossed paths yet considering we are only a few hours a part – you on the “island” and I’m in Vermont. But it will happen! I love your writing and I hope that it some small way it is helping you find your way back. I would be sad to loose you from the world wide web. But I would completely understand. I used to do a blog with stories of my rides but it has been too long since I penned something. I guess life has a way of getting in the way. Motorcycling is my true passion and there is something to be said about meeting people who share the same love for two wheels. Everyone who knows me, even if just through social media, knows that my motorcycle “Tigger” is my therapist and my preacher. I don’t tweet but I do have an instagram – vtgirl2008. I guess I should post a little more on there too… Well, enough about me for now. Thanks for the air space and I hope each day gets a tad bit brighter out there for you. Hugs from Vermont. Been following you for a while and hopefully not annoying you. Love what you do!! Ted of the “Motorcycle Men Podcast” and “Days I Ride Blog” here in questionably sunny New Jersey. Maybe one of these days we’ll cross paths out there on the road. Nope, not annoying. I enjoy listen to the smooth, dulcet tones of your podcast voice. Helps my workday go by. I’ve been following your blog a while also. I enjoy reading about all motorcycle rides, adventures etc. It gives me ideas for my own rides Keep those posts coming! Glad you’ve decided to say hello, Dale! Hello Fuzzy, I started to follow you not to long ago. I also started my blog this year. I love to ride. I live in Mass, Cape Cod area. Riding is my happy pill. No matter what is going on, I can get on the bike and feel good and free. Not that life is bad, but every so often… Any way, it is a great escape and I love to find new things or places on my rides. Ride safe. Hank- Keep the shinny side up. Thanks for saying Hi, Hank. I follow you on instagram and am sticking your blog address in my reader. Looking forward to reading along! You really have beautiful eyes, I like that. Enough? You’re a funny one. You let loose in the comments section but not as much with your own words on your blog. Quite the onion. Hi im Jay Boyle and i been reading you for years. We have done some of the same events. Hammer Runs and had atleast one on the same bikes Drz400. I just enjoy your posts and i don’t follow anyone else anymore. Keep up the rides and have fun. Hi Jay – glad to see your name pop up. You’re an old timer ‘round here 🙂 thanks for sticking with me. Rachael, thanks for sharing your view of life. You strike a chord with all of us. We met briefly several years ago at the Midnight Run, and you also took my picture on Route 2 when I was riding my 305 Scrambler on the Moto Giro. I am 62. My wife and I live in Southern New Hampshire, with our dog Earl and two chickens. I am in IT, supporting a facility with 34 electrical design engineers. I currently ride a variety of bikes. My road rides include a 2012 Yamaha Super Tenere, a 1984 Honda Elite 250 scooter(! ), and a 68 BMW /2. My off road rides include a 2004 KTM 520EXC, a 1984 Kawasaki KDX200 for Vintage stuff, and a modified 1986 Honda TLR200 Reflex, on which I won the New England Trails Vintage Class Championship 4 times. Winter activities include snowblowing and snowboarding. If the roads are clear, I ride to work regardless of the temps. About a year ago, I developed an intermittent tremor in my left side. The neurologist thinks it’s early onset of Parkinsons, and we are trying a variety of drugs. None have helped, and some of the side effects were awful. Medicinal marijuana might be in my future. What does help immensely is keeping my mind and my body occupied. I don’t tremor when I’m riding, especially off road. We’ll see how snowboarding goes this winter. A diagnosis like that must rock your world. I’m sorry to hear it. But it sounds like you have a lot of support and are staying positive by continuing to do the things you love. Keep the faith and give Earl a pet from me. I’m new to your blog but enjoy reading about your rides and especially viewing the fantastic photos you post. I’m 77 years of age, male, married and live in Arizona. I started out riding mostly dirt bikes in Florida in the mid 1960s but pretty much quit riding by 1978 when I moved to Arizona. In 2014 (many years after retirement) I took the MSF class and got my motorcycle endorsement for my driver’s license and started making some 1-day road trips on rental motorcycles. My longest ride has been a 3-day trip (600 miles roundtrip) to Laughlin, Nevada with a friend from California but I hope to make more multiday trips. I haven’t purchased a road bike yet, I’ve been renting so far (Honda Shadows, Harley Davidsons (Heritage & Sportster 1200Ts), Yamaha V Star 1100, Kawasaki Vulcan Classic 900 LT, Indian Scout and my last ride on a Honda 250cc Rebel. I don’t have a blog, facebook or Instagram account to reference, but I do document my rides with photos on a Google Photos account. Right now I’m reading through your older posts trying to catch up. I look forward to reading more of your posts. I’m glad to have you along for the ride. It sounds like youve been keeping yourself busy with the rent & rides. Do you think you will purchase a bike? If so, what’s tickling your fancy? Yes, I’ve been thinking about purchasing a bike. I’ve always wanted a Harley Davidson motorcycle (and still do), but after taking the Honda Rebel 250 on a 1-day road trip, I’ve been thinking about the new Honda Rebel 500. The new Honda Rebels (300 & 500) were designed for new and young riders, but they also make a lot of sense for an old guy like myself. The Rebel 500 would be a low hassle bike and fine for making short road trips. Perhaps the main reason I like the Rebel is that it is a low-weight bike, coming in at only about 415 pounds. I’m not as strong as I was when I was younger and pushing around a heavy bike for parking, etc. doesn’t appeal to me. Currently my short list of new road motorcycles to purchase are (1) a Harley Davidson Sportster (what red-blooded American “boy” doesn’t want a Harley?) and (2) a Honda Rebel 500 (low weight, reliability, 6-speed transmission). Also the idea of an Adventure bike appeals to me, I’ve been reading about the (3) Royal Enfield Himalayan (low weight, seat height) and like that bike a lot (on paper anyway). I have looked at the Himalayan at the local dealer but have not taken a demo ride on one. I’ve also considered purchasing an older used bike of some kind (e.g., Honda 750 Shadow, Harley Sportster), but have decided to go with a new bike if I bite the bullet and purchase one. As you know, every choice you make has advantages and disadvantages, there is no right answer–only better or worse compromises, right now I’m thinking the Rebel 500 would be a good compormise for me. Hey Fuzz, you’re the coolest girl I know. So cool I even married you!!! Officiant, but it’s still saying something. You’re awesome, Catfish. I’ve been meeting up at your store on Tuesdays to go get tacos. I keep hoping you might still be there but you’re always gone for the night. Maybe one day soon I’ll catch you. Hi Rachael, I’m Marty Braun, I’ve been following you off and on for a couple of years, making a comment here and there. I’ve been riding since 82 when I learned in San Francisco, and have seen a lot of California. Jamie and I married in 88 and she rode on the back a few years before getting her own bike in 92. We moved to Maine in 92 to be close to her family in New Hampshire, so we’ve seen a lot of New England and Nova Scotia, where she has relatives. She has an 89 Honda GB500, I have an 89 Honda CB1 400F. We are both freelance illustrators and our daughter is just about to graduate from college. I like reading your posts and love the photos of the ghost signs and roadside attractions. How do you find them all? The people who reply to your posts seem like a nice bunch of folks. I hope we will cross paths with some of them, or you, some time. I follow you both on Instagram. Thanks for saying, “hi” and telling me about yourself. One of my favorite resources for ghost signs is drkenjones.com – it’s fantastic. After a while you kind of get a feel for the type of town that might have a sign. Old, with a railroad line, Main Street, brick facades, places that are past their heyday and clinging to life, places that once housed factories – stuff like that often turns up something good. Thanks again for saying hello. Was there anything in particular that precipitated your nervousness and anxiety? I’m glad to hear you’re working through it. It’s such a joy-stealer. A reasonably quiet follower here. One of many blogs I read and enjoy. Keep up the good work! Hey Andrew – you’re an old timer 🙂 glad to have you along. I’ve been enjoying your writing for a long time, first discovered you on the old WIST list. You sent me a Stelvio Pass postcard one time, about the time I was getting a divorce and that was so helpful, I was feeling pretty alone then. So, you hang tough, you make a difference to many people you don’t even know about. WIST! There’s a blast from the past. I’m glad you’ve decided to tell us about yourself and that you’re here. Thank you for reading and the kind words. If you ever find yourself feeling alone again, don’t suffer through. Reach out. People are willing to help. Me included. presented the lost pet report and occasional contests. My masterpiece was a Valentine’s Day contest in which the grand prize was a husband. ME! Barbara lived out of our broadcast area and had no idea what was going on. On the big day I called her up and proposed on the air. I was confident that I would get the answer I desired. One of my listeners asked “Did you know her?”. I played the contest promo and the phone call at our wedding reception. I would expect nothing less from you Ron. Been following for a long time. Your unique perspective and honesty keep me coming back. A rare combination. Gosh Fuzzy, I’ve been following your journeys and life for a number of years and replying once in awhile. I lead a quiet life in Eureka, California, enjoying my wife, motorcycle, and gardening. I’m not so much into projecting myself into the ether but I admire those that do, especially your brand of riding and sharing not only your rides, but also your love of whimsy and your joys and even your heartache. My best to you. I’m so glad you’re back and doing better, dear lady. J and I sorely missed your presence. Believe it or not, you inspire me to keep doing my thing on my blog. Mad love to you. Reader from Dallas, Texas. Been riding with my wife about 2 years now, started at 45. (Wish I’d started earlier!) Found your blog while looking for more motorcycle oriented blogs to add to my RSS feeds list. I always look forward to your posts because they aren’t necessarily technical, and getting away from the latest helmet review or engine how-to is very refreshing. 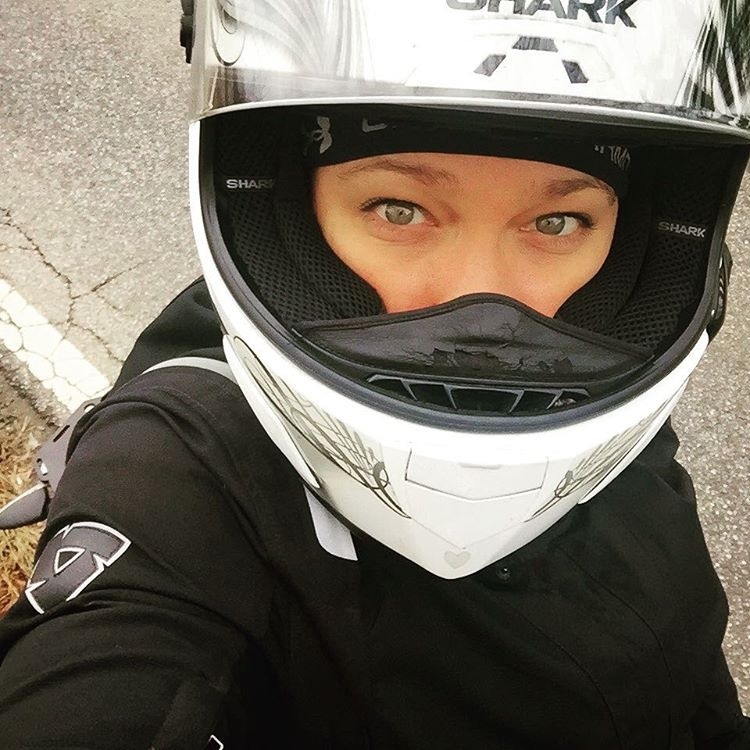 I’m late to the party but I’ve known Fuzz, and her Cruddy counterpart, for 18 years…taking us waaaaay back to the heyday of eSportbike and the craziness that came along with participating on that motorcycle forum. I’ve had the great pleasure of crashing at their place a couple of times, went on trips together (WV/PA/KY), attended her wedding and I gave her much loved ’98 Kawasaki ZX-6R a new home when their stable was overflowing (did Greg build the motorcycle Ferris Wheel storage contraption yet!? LOL). Together, we’ve shared fun times and silly times and even really really sad times . I spend too much time lurking in life (real and virtual) and really miss getting to see and interact with two most excellent people. You’re the best, and really happy to see you posting again with regularity. Wow, as usual, I am late reading and commenting, but have been following you for years! Not sure, but I think I found you via Toadmama. I’ve been riding 20+ years, blogging for 5ish, retired for almost 4 years, and Moto-RVing about that long. I absolutely love this photo of you Fuzz…and am so glad to see you feeling better, writing, and riding again…we’re all with you! Honestly, this blog has been a major inspiration for me to draw on when I’m making my videos. I appreciate the humanity and vulnerability you display and, when I wrote my first script, decided to be more revealing and open about myself in the hopes that it could possibly help out someone out there, even if it’s just by showing them someone not that different than themselves. Thanks for all the good writing. I think about it all the time. Travel Souvenirs – Send me a Postcard, Please!